Broadway Barks, the star-studded dog and cat adopt-a-thon benefiting New York City animal shelters and adoption agencies, will return for a 13th year this summer. | The event, produced by Broadway Cares/Equity Fights AIDS, will again take place in Shubert Alley with festivities beginning at 3:30 pm and celebrity presentations of pets from citywide animal shelters beginning at 5:30 pm. 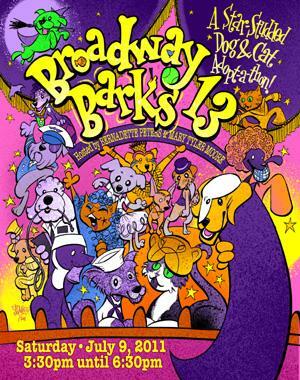 | Broadway Barks 13 will help many of New York City’s shelter animals find permanent homes by informing New Yorkers about the plight of the thousands of "homeless" dogs and cats in the metropolitan area. Celebrities scheduled to lend a hand in the presentation of adoptable pets from citywide shelters are Nick Adams (Priscilla Queen of the Desert), Nina Arianda (Born Yesterday), Heidi Blickenstaff (The Addams Family), Kerry Butler (Catch Me If You Can), Norbert Leo Butz (Catch Me If You Can), Reeve Carney (Spider-Man: Turn Off the Dark), Victoria Clark (Sister Act), Jennifer Damiano (Spider-Man: Turn Off the Dark), Paige Davis (Boeing-Boeing), Adam Godley (Anything Goes), Joel Grey (Anything Goes), John Benjamin Hickey (The Normal Heart), Jackie Hoffman (The Addams Family), Nikki M. James (The Book of Mormon), Isabel Keating (Spider-Man: Turn Off the Dark), Beth Leavel (Baby It's You), Joe Mantello (The Normal Heart), Michael McGrath (Born Yesterday), Judy McLane (Mamma Mia! ), John McMartin (Anything Goes), Patina Miller (Sister Act), Michael Mulheren (Spider-Man: Turn Off the Dark), Bebe Neuwirth (The Addams Family), Rory O'Malley (The Book of Mormon), Brad Oscar (The Addams Family), Peter Page (Spider-Man: Turn Off the Dark), Andrew Rannells (The Book of Mormon), Elizabeth Rodriguez (The Motherf**ker With the Hat), Will Swenson (Priscilla Queen of the Desert), Aaron Tveit (Catch Me If You Can), and Yul Vázquez (The Motherf**ker With the Hat). Broadway Barks will feature a sampling of adoptable pets from Animal Care & Control of New York City, Adopt A Boxer Rescue, Animal Haven, Anjellicle Cats Rescue, Animal Relief Fund, the ASPCA, Brooklyn Animal Resource Coalition, Bideawee, Bobbi & the Strays, City Critters, Humane Society of New York, Husky House, Kitty Kind, Long Island Greyhound Rescue, Loving Touch, Manhattan Valley Cat Rescue, Metropolitan Maltese Rescue, Mid Atlantic Great Dane Rescue, North Shore Animal League America, Pet-I-Care, PLUTO Rescue of Richmond County, Russell Refuge, SaveKitty Foundation, Sean Casey Animal Rescue, Stray from the Heart, Tigger Foundation, Urban Cat League and Waggin' Train Rescue. Representatives from these organizations will be on hand to offer educational information on spaying and neutering. The event is free. Funds raised from a raffle, silent auction, signed memorabilia sales and donations are distributed to the participating shelters and rescue groups and to the Picasso Veterinary Fund, which is administered by the Mayor’s Alliance for NYC’s Animals and provides grants to shelters and rescue groups to cover extraordinary veterinary costs. Last year’s Broadway Barks, hosted by founders Mary Tyler Moore and Bernadette Peters, attracted more than 7,500 theatre fans, pet owners, animal lovers and Broadway stars from the hit shows of the season. The event featured the participation of more than 27 animal shelters from the New York City area, which led to a total of more than 200 adoptions. Check back soon for information about celebrity participants and more details.